The internet is filled with a lot of garbage, more so than ever right now. Outside of everyone and their toe having a hot take, the real garbage I’m referring to is the wave of made-up-nonsense news that flooded places like Facebook during the previous election or has potentially been crawled by Google and placed into Search results. Because the world is a better place when purposely misleading trash is called out for being purposely misleading trash to help you laugh in the face of your scary middle-of-no-where extremist uncles and aunts as they go about sharing it, Google is making it clearer than ever when something has been fact checked. 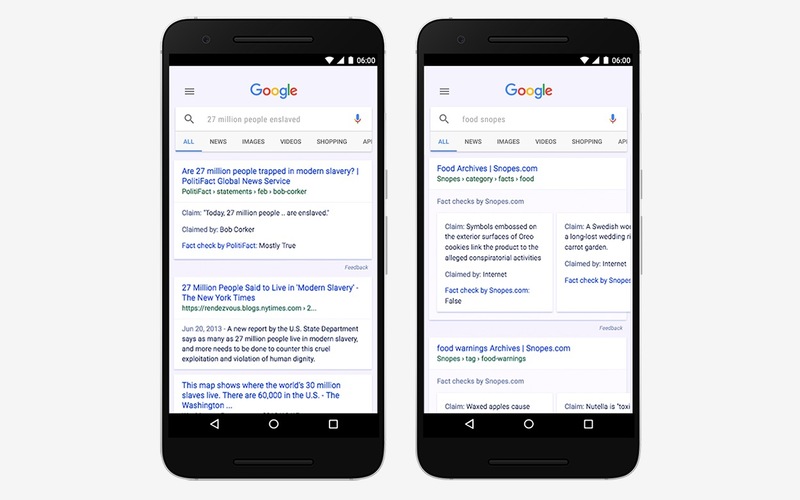 In Google News results, you’ll now see clearly marked information about news articles that have been checked. The claim is highlighted, along with the person who made the claim, followed by a fact check on whether or not it’s true. Take a look at the image above to see how this will look. Starting today, Google is rolling this out everywhere from News to Search. Of course, you won’t see it in every result, but when you do, you’ll hopefully be a more informed individual who isn’t just screaming “FAKE NEWS!” because the information doesn’t align with your whacked out beliefs. Facts are important. Correct information, whether we agree with it or not, is important. Don’t be the sh*thead who isn’t about a factual world. If you are a publisher and want to have your articles in this whole fact-checking thing, hit up the link below to get the instructions. Friday Poll: Do You Use a Case on Your Phone?